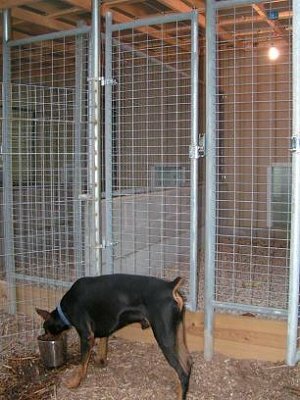 2002 Itasca Suncruiser Motorhome: All dogs ride in appropriate size sturdy wire crates with soft bedding. Dogs I carry never stay in the show site. They are always with me. All dogs rotate out for play and R and R time! The Pom Room:I have converted a room off of my bedroom into the Pom Room. I put "wee wee" pads or paper down on the vinyl floor and have two separate areas for dogs who may not play well with others. The floor is mopped twice daily with Odoban and since this is right off my bedroom all paper or pads are changed very frequently, lol! 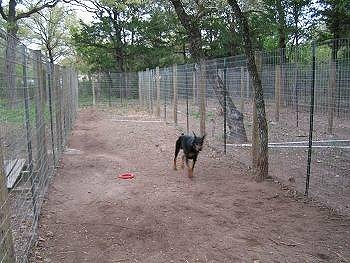 I do have an area outside on a wood deck that is fenced off for poms as well if the weather is not overly warm. Otherwise I tend to keep them inside in the A/C during the summer months. 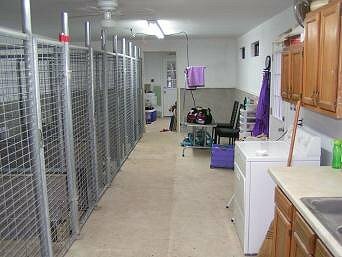 Kennel: My kennel building was completed (for the most part, lol!) in February, 2008. It is attached to our home in our living room with a window that also connects it to our bedroom so I can always see and hear my client dogs. Right now I have 5 indoor/outdoor runs: indoor runs are, of course heated and air conditioned and are 5 ft x 5 ft. Outdoor runs are completely covered 5 x 10 ft gravel spaces. Each 2 runs open onto one 10 x 80 ft play yard. 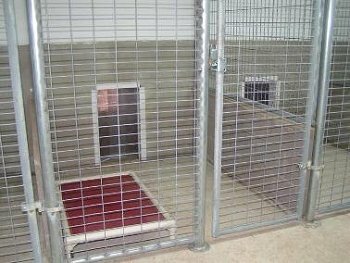 I find that some dogs show better for me if they live in the kennel, although if your dog is a good fit with my pack and she has impeccable house manners sometimes they end up sleeping on our bed, LOL! block walls separate each run. The back wall is stucco. 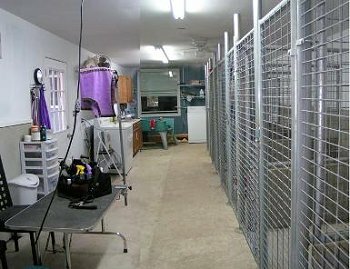 kennel looking toward the back room. This is looking the opposite direction, from the back room toward the house. Our bedroom is on the other side of that window. Gates to and from the play yards can be closed if the weather is bad. Each two gravel runs share an 80 ft play yard. Play yards are currently pea gravel.